What do I need to bring to my Pilates class? Please bring along a small towel and a pair of anti-slip socks for your Pilates workout. You may also purchase anti-slip socks at our reception desk before attending your class. You can also bring water bottle along. What should I wear to the Pilates class? Please wear comfortable & fitting aerobics attire. You won’t go wrong with a t-shirt or tank top matched with shorts, slacks or tights! Socks are compulsory at Pilates Fitness – we recommend anti-slip socks. Do I need to be fit to start Pilates? Pilates does not require any fitness pre-requisites. You can begin Pilates classes anytime, and at any level of fitness. An average active person who attends 2-3 classes per week should see results within 10-12 classes. This will vary depending on each individual and other factors such as the number of classes attended each week, the nature of the class (private or group classes), participation in other physical activities, diet, and the presence of any existing injuries. The biggest benefit you can gain is body awareness — awareness of how you sit, stand or move and being able to relate those habits to the aches, pains and injuries you may have or have had in the past. At the end of 15 sessions, you can expect an increase in strength, flexibility, mobility, balance, and body awareness, as well as a decrease in back pain and other general pains. Pilates is unlike Yoga. Yoga poses are considered as a preamble to center, calm, and prepare your body for concentrated sessions of seated meditation. In contrast, Pilates was developed as a logical system of exercises specifically designed to enhance and balance the physical, mental, and spiritual aspects of the human body. In other words, Pilates is not about sitting still or holding poses — Pilates is about movement! In addition, although both Yoga and Pilates are breath-based disciplines, the primary styles of breathing are quite different. Yoga teaches you to breathe in and out through the nose, which helps to calm the nervous system down. Pilates teaches you to breathe in through the nose and out through the mouth. The diaphragmatic breathing method of Pilates helps to engage your core muscles throughout the exercise. The table below illustrates the key differences between Pilates and Yoga. 1/ Pilates focuses on working the imbalances of the muscles – to tone, to lengthen and to strengthen. Yoga aims to calm the mind, empty the mind and to still the mind. 2/ Pilates is active movements. You are always moving with control strokes. There are very little instances where you are holding a pose. Yoga on the other hand, brings you to a pose and encourage you to hold the pose, usually for 10 counts as you breathe in and out. Modern yoga classes such as Flow Classes have more fluid movements requiring less stationary poses. 3/ Pilates is about building muscular strength to perform your daily activities efficiently and effectively. Pilates helps you to build long toned muscles so as to preserve the flexibility required to keep your joints mobile and healthy. Yoga on the other hand, tends to focus on flexibility as Yoga classes are performed without additional resistance other than the body weight. 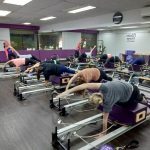 4/ There are about 6 different Pilates equipment – Pilates mat, Pilates Reformer, Pilates Cadillac, Pilates Chair, Pilates Barrel and Pilates Spine Corrector. Mat-based workouts are very convenient and can be done anywhere. Adding light equipment and the larger resistance equipment will place more emphasis on your outer limbs and add variety and intensity to your program. What is Pilates Jumpboard Class? A special Pilates equipment called the Jumpboard is attached to the Pilates Reformer to intensify the Pilates workout. For those who find that regular Pilates classes cannot provide them with the “extra kick”, the Pilates Jumpboard will give you a lovely surprise. This class may not be suitable for people with knee injuries. What is Pilates Mat Class? Pilates Mat Class utilises your own body to provide resistance for an overall workout. Various props such as toning balls, flex bands and resistance circle are used to add resistance and provide variations. What is Pilates Reformer Class? Pilates Reformer class uses Pilates Reformer machine as the main piece of equipment to perform Pilates exercises. The Reformer glides forward & backward on rollers and uses springs for resistance, along with other attachments, for a wide variety of exercises and positions (i.e. lying down, seated and standing). How is Pilates different from other weight or resistance exercises? Pilates was developed by Joseph H Pilates (1880 – 1967) and originally named as Body Contrology. Pilates created “The Pilates Principles” to condition the entire body: proper alignment, centering, concentration, control, precision, breathing, and flowing movement. This unique set of 500 different exercises are being practised by more than 11 million people worldwide today. No matter what your age or condition, Pilates will work for you! Can you give me a google map location pin? I may get lost. Sure. The new studio is located at 52 Telok Blangah Road, Telok Blangah House, #02-13/14, Singapore 098828. Google map directions from Vivocity to Telok Blangah House is available here. If you are taking a bus, please stop at Bus Stop 14119. What is the nearest MRT? How accessible the new studio location from the mrt? Its a 5 minutes walk from Harbourfront Mrt. Exit to the Vivocity bus stop and cross the road. Is there any parking slot nearby? Is the parking free? We have 2 FREE car park slots at Telok Blangah House (52 Telok Blangah Road, #02-13/14, Singapore 098828) basement carpark for our members, limited to 2 hours per car on a first come first served basis. When you turn into the carpark, please dial the mobile indicated on the gantry to contact the security guard. Inform the security guard that you are coming for class at Pilates Fitness. In the event the car park is full, there are paid parking at Bay hotel or Vivo Shopping Mall. Where is this place? I never heard of it? Telok Blangah Studio will be relocating to bigger studio space at Telok Blangah House (52 Telok Blangah Road, #02-13/14, Singapore 098828) as existing location will be redeveloped. Telok Blangah House is a commercial building directly across the road from Vivocity Shopping Mall, next to Bay Hotel. It is 5 minutes walk from Vivocity Shopping Mall. Will the classes be the same? We will be offering the same classes at the moment. Last day of operations at Telok Blangah Studio is on 23 Oct 2018. We will be closed for 3 days for the move. We will reopen on 27 Oct 2018 at the new location. Will classes at Telok Blangah be affected due to the move? Is the new location convenient? We believe that the new location is more convenient than current location as it is right opposite to Harbour Front MRT, there is no need to take any buses down from Harbourfront MRT. Oh, I prefer the current location, why do you have to move? We are moving to a bigger studio as current location will be redeveloped.